Fed minutes preview: What to expect of Gold? The Federal Reserve left interest rates unchanged after its July 25-26 meeting and indicated it could begin shrinking its bond portfolio as soon as September. The minutes of the meeting will be released today at 18:00 GMT. Is Fed still willing to look through weak inflation? The wait for pick up in US inflation continues. The official number for July released last week once again printed below estimate. The inflation expectations as represented by the 5-year, 5-year forward inflation expectation rate fell sharply during March - June period. The USD was offered across the board during the same time period. It clearly shows the outlook for the USD is primarily dependent on the inflation numbers. However, it is worth noting that the pick up the inflation expectations from the June low was ignored by the greenback till last week. The USD is finally catching up with rising inflation expectations this week. If the minutes indicate that more Fed policymakers see the weak inflation as long-lasting, it could reduce the chances of an anticipated hike, thus the USD would drop. On the other hand, the corrective move in the USD would gather pace if the policymakers blame low inflation on transitory factors. Debt limit: The Treasury Department has said the government has enough money to pay its bills on time through September. Meanwhile, the Fed is widely expected to start its balance sheet runoff program in September. The minutes due today would shed light on whether policymakers are worried about the debt showdown. Cautious comments could weigh over the USD and vice versa. Balance Sheet Runoff: The July statement said the policymakers are in favor of reducing the Fed's $4.5 trillion portfolio of bonds and other assets "relatively soon”. The markets believe ‘relatively soon’ means September. The minutes may provide a more definitive signal on the timing of the runoff. Hint at September could lead to a steeper Treasury yield curve and strong dollar. Commentary on interest rate: Minutes are likely to reiterate that policymakers favor gradual rate hikes. Major changes aren’t expected on this front. The chart above clearly shows the rising channel is intact… meaning the pull back from the recent high of $1292 could be another opportunity for investors to board the freight train. Only an end of the day close below the trend line support of $1264 would signal that a top has been made. 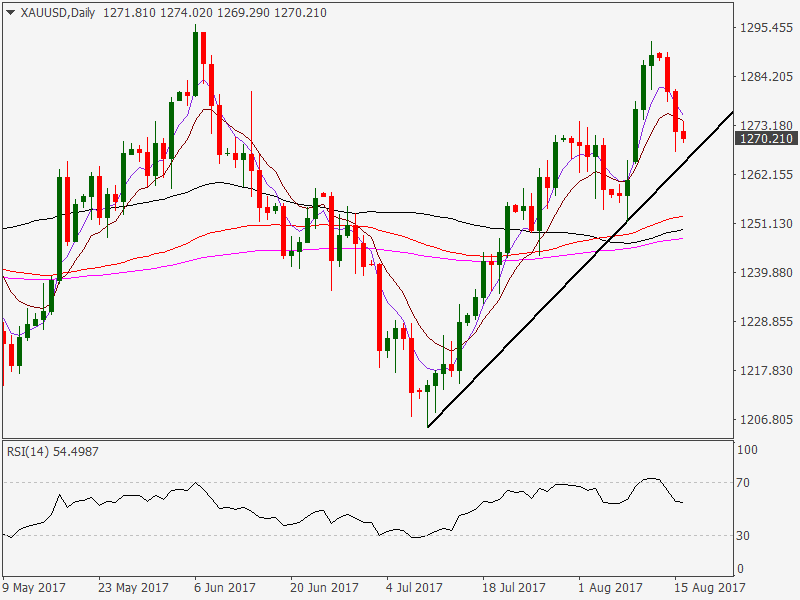 The metal could then test demand around $1248-1242 levels. Such a move looks likely if the Fed minutes ignore weak inflation and hint at September balance sheet runoff. On the other hand, a solid rebound to $1285 levels could be seen if the Fed minutes sound dovish. Traders are advised to keep an eye on the yield curve, i.e. the difference between the 10-yr yield and the 2-yr yield. The USD loves a steeper yield curve and vice versa. The changes in the yield curve would indicate if the markets believe what the minutes say. A steeper yield curve is gold bearish and vice versa. An upside break of the falling trend line on the chart above would open doors for more steepening of the yield curve.